Birdathon 2018 was a huge success, and we couldn’t have done it without our dedicated teams, generous sponsors and donors and the 250 individual supporters. We surpassed our $40,000 fundraising goal by $1,469 and hit a new record this year with 33 teams participating! 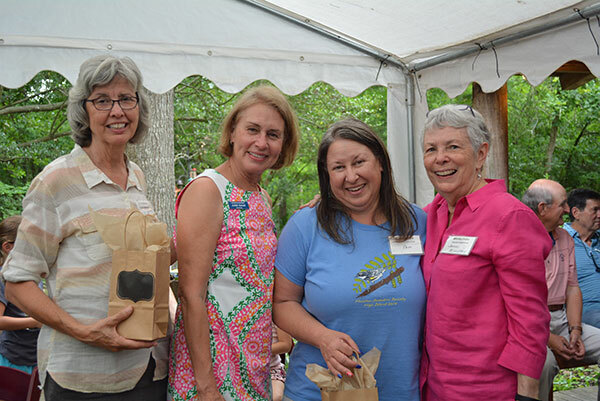 Special thanks to our Birdathon Committee, who put in a lot of hard work to make this event a success: Jonni Almoney, Cindy Bartos, Judith Schott and Pam Smolen. 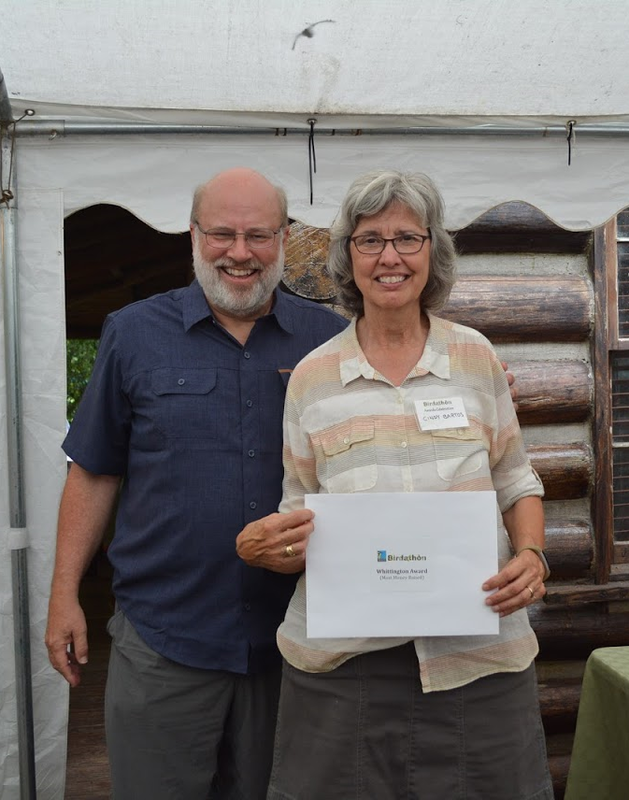 We celebrated the conclusion of Birdathon with an awards celebration in the cabin at the Edith L. Moore Nature Sanctuary. Guests mingled while enjoying tacos, ice cream and refreshing drinks (including beer and root beer donated by Saint Arnold Brewing Company). Thankfully, we avoided the rain and had a nice breeze on the deck of the cabin. The centerpieces were native plants from the Edith L. Moore Natives Nursery – a mix of Texas Coneflowers, Indian Blankets, Lanceleaf Coreopsis and Black-Eyed Susans – which guests were able to take home to plant in their gardens. We kicked off the party with the Best Story award, where we got to hear some hilarious and interesting stories from participants about their big birding day. While all the stories received lots of laughs and applause, the Edith Moore Eagles took home the prize of 4 tickets to the Houston Museum of Natural Science and Houston Audubon pins. 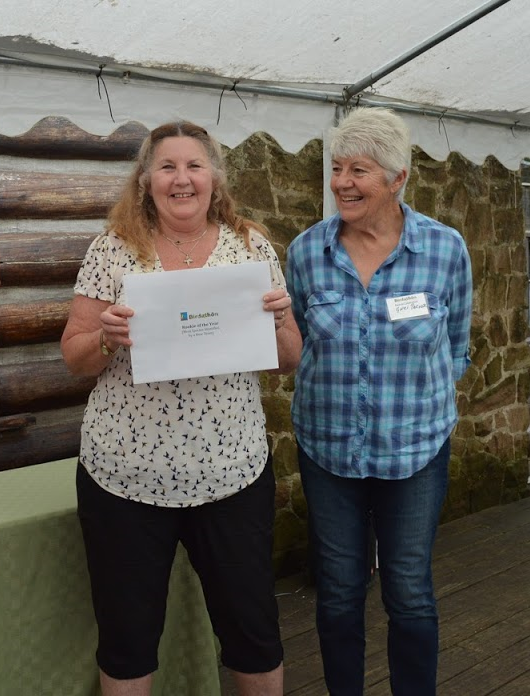 The Oberholser Award for identifying the most species was won by the High Island Crew (Winnie Burkett, Julia Garrett and Barbara Tilton). They spent a full 24 hours birding from the Big Thicket to the Bolivar Peninsula, which resulted in spotting 162 species. Their prize was a 2-night stay at the Bon Ton Roulet Cabin in Junction. The High Island Crew also won the Whittington Award for raising the most money. They did a fantastic job fundraising $4,636. Since teams can’t win more than one prize, the award was given to the second place winners – the Wandering Warblers (Cindy Bartos, John Bartos, Sara Bettencourt and Jim Winn) for raising $3,380. They won a 2-night stay at The Peaceful Pelican Bed & Breakfast in Palacios. Finally, the Rookie of the Year award, which is given to the first-year team that identified the most species, was won by the Noddy Roadrunners (Teresa George, Lee Kobs and Geraldine Parker). This was the first year this team had participated in Birdathon and they identified 132 species! 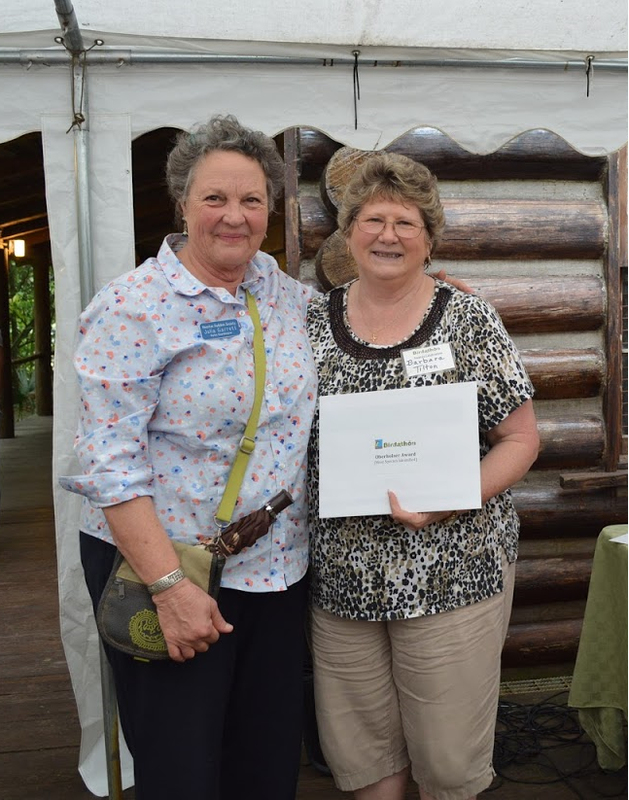 They were awarded an owl prowl at Edith L. Moore Nature Sanctuary. Although teams with staff involvement aren’t eligible for awards, we’d like to give a special mention to the Running with Scissortails team (Peter Deichmann, Daniel Elting, Kayla Ferron and Kristen Vale) for identifying 172 species and the Flat-footed Boobies (Julie Gold, Terrell Sword, Bob Westendarp and Heather Westendarp) for raising $4,011. We also gave away a signed copy of Victor Emanuel’s One More Warbler as a door prize. Thank you to our donors for thoughtfully contributing all of the prizes as well our very generous sponsors for helping make Birdathon a success. Rebecque Demark of Heritage Texas Properties, Larry Abbott of Abbott Contracting and Terrell Sword of Sword Plumbing Company, Inc. The party was a really fun way to end the Birdathon season. While we’re sad it’s over, people are already talking about Birdathon 2019, and we can’t wait! The kickoff event held on March 11, 2018. Final event where the results and winners were announced. Held on May 20, 2018.